Can global warming be reversed? 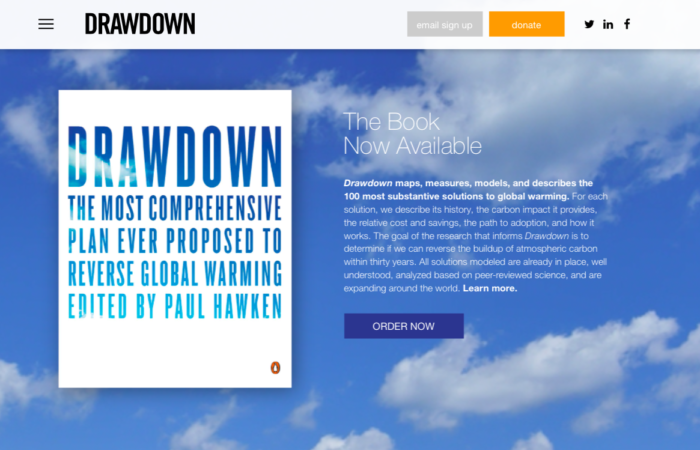 Yes, says Paul Hawken’s Project Drawdown, a non-profit organization dedicated to exploring and advocating how we can reach drawdown – the point at which the concentration of greenhouse gas emissions starts to fall – within the next thirty years. Not only can we reduce these emissions, but actually reverse the trend. Rather than succumbing to the “we’re all doomed” view of climate change, Project Drawdown is spreading the message that not only is this reversal possible, but that the solutions we need to do this are already in place. It’s just a question of scaling them up. For the book ‘Drawdown’, available now from Amazon, the organization evaluated the solutions that are currently being implemented around the world and selected the best for inclusion. The result? “The most comprehensive plan ever proposed to reverse global warming”. Among the solutions you’ll find plenty of clean energy projects, but the organization has looked beyond this to evaluate the impact of a wide range of solutions including educating girls, clean cookstoves and family planning too. We’re particularly intrigued by what the book calls “coming attractions”, unique, game-changing solutions. These include a project to repopulate the Mammoth Steppe by reintroducing reindeer and other herbivores to subpolar regions. As the grazers push away the insulating layer of snow to feed on the grass, it brings down the temperature of the soil and traps long-term carbon beneath. Also noteworthy is the marine permaculture project to sequester carbon dioxide with floating kelp forests in the ocean. Matter of Trust’s president and founder, Lisa Gautier, was chairwoman of Project Drawdown from June 2016-January 2018. Please visit their website at Drawdown.org for more information on how you can get involved.